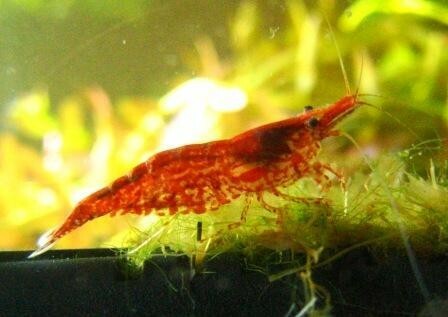 Red Cherry Shrimp, or, more popularly, the Cherry Shrimp originally thought to have come from Taiwan is freshwater specie that has gained such popularity because petting ease. 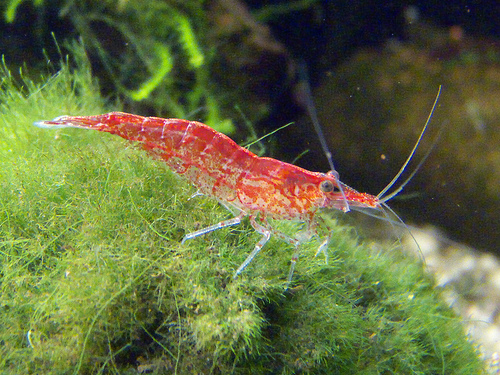 These shrimps are easy to keep in aquariums and are in high demand mainly because of its attractive red color and ease in care and maintenance. 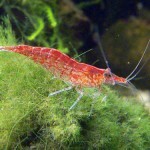 Other shrimp species that are prevalent in aquarium trade include the Yellow Cherry Shrimp and the Black Cherry Shrimp. The skin of these species is very nutritional as it is said to contain many minerals. It is also seen that the exoskeleton is similar to that of that of the living one. The water Ph level and the temperature of the tank determines the intensity of the color of the shrimp. High protein rich foods help to enhance the color of their skin. 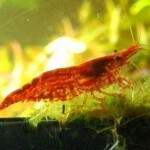 They are also found in various other colors like yellow cherry shrimp and black cherry shrimp. 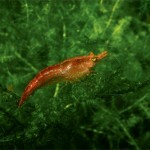 Size of Cherry Shrimp: The size of an adult cherry shrimp is 4cm.The males are smaller than the females. 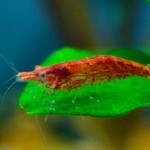 Color of Cherry Shrimp: The color of these species is greenish brown. The males are darker than the females. The developing eggs have markings on the back portion. These species are very serene by nature and are found active mostly during the day. These species like to thrive on the algae or the detritus. One can also see them quite active within the tank territory. The pregnant females like to hide themselves in some dark corners. The females usually carry the eggs beneath them. These species live on plant materials and like organic matter in their diet. They also like to thrive on certain microscopic organisms. In case of these species the mating may occur anytime as they don’t have any specific season. The females also produce pheromones to attract male. It also assures in production of a healthy offspring. These species lay eggs after a relatively short mating process. The eggs are either white or yellow in color. It is seen that the rate of reproduction is more in case of these species. After three weeks of production of eggs, they start getting darker in color. They don’t have any kind of planktonic stage of larva. They can be only spotted after few days of emerging out of the larva. The newly born one is as small as 1mm in size. The offspring intend to hide themselves under the plants and rocks and thrive on plants. These species usually shed their exo skeleton or the skin. In order to shed they try to touch their tail. The skin left behind reflects a U-shaped body. Shedding seems to be a rapid process and they come out in the open in a little while. These species can withstand different conditions of water. In order to protect themselves they produce a secretion called mucous to defend them from infections and parasites. Moreover, this secretion only helps them move faster. The primary predators of the Cherry shrimp include the Angel fish and the Crabs. 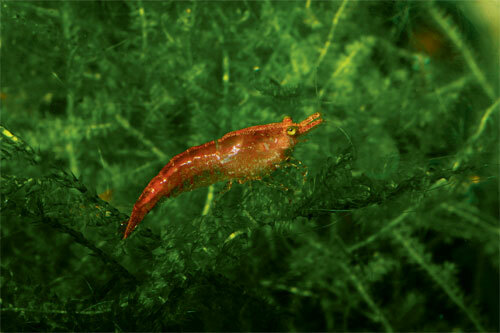 Other carnivorus shrimps also include the predators list of the Cherry Shrimp. Proper Housing: One can keep about 2 to 4 species in the same container that has a capacity of 4 – 8 liters of water. It is also important to supply them with ample quantities of aquatic vegetation for a suitable habitat as well as diet. Moreover after shedding they like hide under such vegetation. Proper Plants: It is good to put plants like java fern and moss within the aquarium. The green color of the plants generates a beautiful contrast with the color of the shrimps in addition to other benefits. In order to remove nitrates from the water, water plants like hyacinth, Elodea can be used. These act as active nitrate filters. 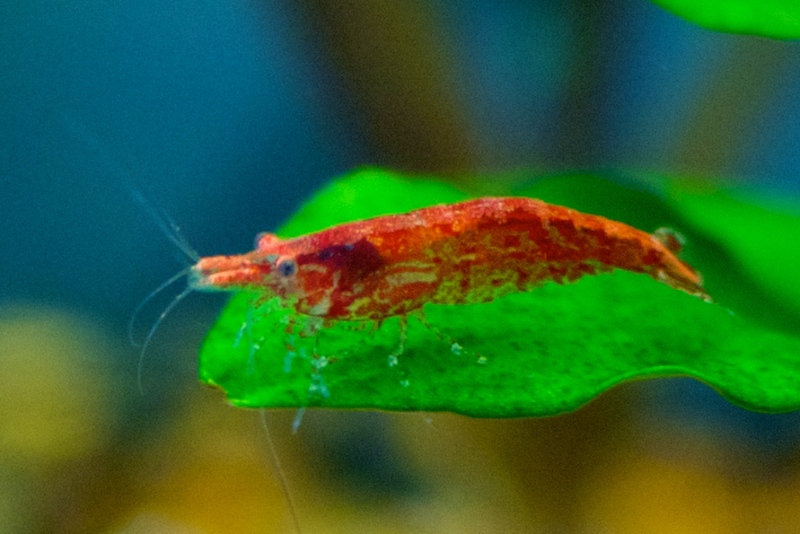 Proper Substrate: As mentioned above that the shrimp changes color depending on its surrounding, if the color of the tank substrate is light then these species tend to look transparent. The dark colored substrate would help them to develop full color. Proper Temperature: One should be careful in maintaining a comfortable temperature and keep it within 57 to 86 degree Fahrenheit. Proper Ph Level: It is necessary to keep the Ph level of water in the tank hovering within 6.5 to 8. Proper Food: These species like to have algae and algae wafers for their diet. In addition to this, they also like spinach, baby carrots, pea etc. One should refrain from adding copper to their diet since it can prove to be fatal. Temper: By nature these species are very shy. Therefore, it is better to keep them with serene fishes. These species can actually live for about 1 to 2 years.